Annan returned from Central Park with a point after a hard fought match were boosted by the arrival of new manager Gary Bollan who added emergency loan Blair Malcome from Ross County to the Blue Brazil’s starting line up. Both teams were hampered by suspensions, Cowdenbeath were without Fraser Mullen and David Symes and Annan had to re-shuffle the centre of their defence with Peter Murphy and Ayrton Sonkar taking up the reigns at the centre of Annan’s defence with both Steven Swinglehurst and Peter Watson serving a one match suspension. Annan started very much on the front foot taking the game to Cowdenbeath with shots from Orsi and a Ryan Sinnamon free kick not seriously testing David McGurn in the Cowdenbeath goal. Murphy came close for Annan in the 16th minute when his low shot flashed past the post following a patient build up. Cameron Muirhead came close for the home team in the 20th minute when he found himself one on one with Ayrton Sonkar but his 12 yard shot failed to hit the target. Minutes later Matthew McInally collected the ball wide on the right finishing with a dangerous ball across the face of the Annan goal but dissapointingly nobody was on hand to connect with the inviting cross. As the game approached the half hour mark Sonkar narrowly headed over the bar after connecting with a Sinnamon Free kick. This was followed by a shot from Aiden Smith which was confidently saved by McGurn. As the match approached half time Owen Moxon had a good effort which was deflected for a corner but in the 42nd minute Annan struck when Brannon’s cross picked out Aiden Smith who rifled the ball into the roof of the net from 12 yards to give Annan the lead. Annan’s joy however was almost short lived when moments later Cameron Muirhead was denied a goal when Scott Hooper averted a dangerous situation clearing the shot off the goal line. Cowdenbeath started the second half with more attacking flair and in the opening minute Brad Smith’s inviting cross was begging for someone to connect with it but Annan got lucky, minutes later Harvey Swain’s effort was saved at the second attempt by Atkinson. Aiden Smith tested keeper McGurn in the 58th minute and a minute later the keeper easily save Sinnamon’s free kick. Blair Henderson was booked for simulation in the 61st minute and at the other end Cowdenbeath’s Brad Smith had a good opportunity in the 60th minute when his pace took him past Murphy but his disappointingly for the home crowd his low shot went agonisingly wide of the target. The home team were building up momentum and in the 62nd minute the Annan goal survived when substitute the ball fell invitingly for Jordan Garden but his effort failed to hit the target from 10 yards. It was a let off for Annan but there was to be no reprieve in the 70th minute after Kyle Miller squared the game with a superb low shot from 30 yards which gave Atkinson no chance. Annan immediately brought on Rabin Omar for Scott Roberts. The game was set up for an exciting last 20 minutes with the outcome in doubt but as the game progressed the home team lost the impetus with Annan starting to impose their authority once again on the match. In the end both teams had to be content with a share of the points which possibly suited Annan more than Cowdenbeath who displayed more than enough to suggest that they can work their way out of the situation that they currently find themselves in at the foot of the table. 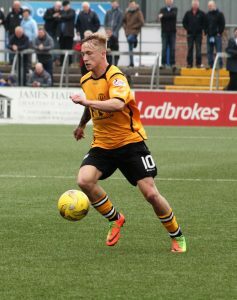 Annan Athletic – Jim Atkinson, Scott Hooper, Jack Brannan, Owen Moxon, Ayrton Sonkar, Peter Murphy, Dan Orsi, Ryan Sinnamon, Aiden Smith, Blair Henderson , Scott Roberts ( Rabin Omar 70 min) Substitutes not used Alex Mitchell (gk), John Cunningham , Brandon Luke, James Creaney, Kevin Ructkiewicz. COWDENBEATH – David McGurn, Matthew McInally, Harvey Swain, Jamie Pyper, Scott Rumsby, Blair Malcom ,Jack Whittaker, Kyle Miller, Cameron Muirhead (Robbie Buchanon 74 min), Brad Smith, Trialist ( Jordan Garden 61 min). Substitutes not used: Blair Penman GK, Shaun Rutherford.